A typical day begins with the sorting of donated goods which are collected from our 28 collection points across SA. Volunteers check all the donations and store them in containers, ready to be packed into backpacks. Another group of volunteers packs the backpacks according to lists of contents which have been compiled by the child welfare professionals we work with. Coordinators use cash donations and the proceeds of fundraising activities to purchase shortfall items so that backpacks can be completed. The backpacks are then stored on our extensive rack system, waiting to fill orders as they come in. Our coordinators receive requests for backpacks from the agencies we work with across the State. These orders are processed and our Helper group, which is made up of long-time experienced volunteers, locates the backpacks on the order from our shelving system and checks the contents to ensure quality control. This is done to be certain that every Backpack which leaves our warehouse is full of high quality goods. The kids deserve nothing less. 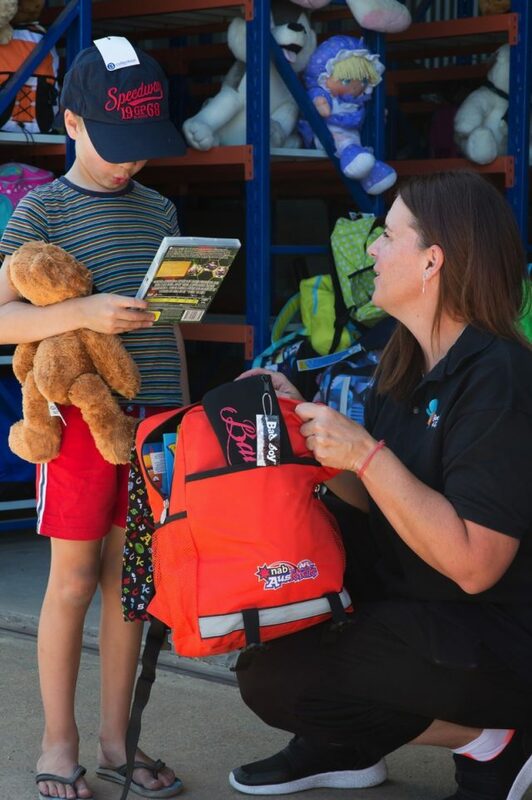 When the order is complete, it is ready to be shipped out to the requesting agency, and the backpacks are then taken by the agency workers when they go out to assist a child, or a homeless family. The same process is followed for Home Starter Packs and Anchor Packs. With the exception of two paid employees, all tasks are done at our warehouse by a fantastic group of volunteers, who work tirelessly to make life better for these vulnerable children and young people. That is the structure of a typical day, but in reality, so much more happens on any given day, as Rachael, Kelly and the other coordinators run sessions for new volunteers, both individual and corporate; make visits to community groups and schools to promote Backpacks 4 SA Kids; liaise with new agencies; fill emergency orders, and organise our extra activities such as the annual Christmas Drive, plus our fundraising activities. We have supported Backpacks4SAKids for a while and have finally been approved as foster carers. Our first visitors came with Backpacks. I didn’t think much of it to be honest, but I showed them to their room and they carefully put away the things from the backpacks. I waited for them to come back to the lounge room and when they did they still had their backpacks on their backs and grinning from ear to ear. They only had their toys, books, colouring and DVD left in the backpacks and the clothes, pyjamas and underwear were in their drawers…but those smiles took my breath away. You do something so simple, but it works for these kids. Amazing.